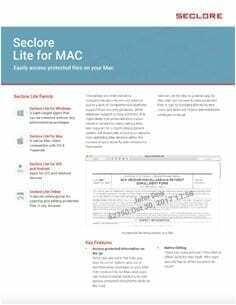 ﻿The Seclore Connector for McAfee DLP automatically extends your DLP discovery rule in McAfee ePO to confidential files discovered by McAfee DLP allowing you to enforce your corporate IT policies to anyone who is allowed access to your information. Global Financial Services company uses Seclore Data-Centric Security Platform to replace email encryption and automatically apply granular usage controls as documents are detected, labeled, and downloaded from DLP, Classification, ECM, and Enterprise Systems. This IDC Technology Spotlight explores the growing need for data-centric security, associated challenges, and recommendations for how to optimize your investments. Watch how Seclore Data Classification seamlessly integrate with Seclore Rights Management, making it easy for organizations who require greater document security and tracking. See how DLP, Classification and Rights Management work in concert to better protect and track your information. Learn how Forcepoint DLP and Seclore work together to detect, protect and track your sensitive information. See how Forcepoint DLP and Seclore Work Together to Automatically Protect Documents Upon Discovery. Increase the value of your Data-Centric Security investments with Seclore Unified Data Policy Manager. Discover how the combination of DLP and Rights Management will better protect against data loss. This case study throws light on how Tata Strive is utilizing Seclore Rights Management to control and track the usage of training documents they share via the cloud, including the ability to remotely revoke access. Seclore Data Classification, powered by the best-of-breed classification product, Classifier from Boldon James, enables organizations to easily define and apply classification to their documents as they are created and modified. Donnelley Financial Solutions (NYSE: DFIN) provides software and services that enable their clients to communicate with confidence in a complex regulatory environment. An interview with GDPR expert Robin Basham from EnterpriseGRC about how data-centric security can help organizations address core aspects of GDPR compliance. MCAG, provider of class action settlement services and financial audits, deployed Seclore Rights Management to their IT infrastructure to add granular control over the usage of data by employees and third parties. Trends that are driving the emerging demand for data-centric security, The headlines show us that in spite of huge investments in security solutions, data breaches and loss continue to plague every organization. Reliance Capital, a growing financial services company needed to protect information that flowed between five business units and beyond their perimeter. See how Seclore helped them collaborate efficiently and securely. Hear how Richard Daley from Tejon Ranch is automatically protecting his most sensitive data that is downloaded and shared from IBM ECM without interfering with the productivity of his internal and external collaborators. Seclore announces the industry’s first agent-less data-centric security solultion that eliminates the barriers preventing widescale adoption. Highlights from the ESG Report, “Securing Data in the Age of Collaboration”, such as top concerns by security professionals, and stats on what types of sensitive data that is most shared and how it’s shared. As enterprises increasingly collaborate with partners, outsourcers, sub-contractors and prospects using file-sharing, email and mobile devices, Seclore enables companies to persistently secure and audit the use of this information as it flows within and outside of the enterprise. Here are some stats you can’t ignore and the impact of data loss to your company. Watch how easy it is to secure emails and files that you are sharing internally and externally, as well as ease of use for recipients to open a protected document. Due diligence and bid tendering documents and engineering standards and guidelines are just a few of the ways Seclore is helping Oil and Gas companies secure their critical information to protect them from financial and reputational losses. A major obstacle to the success of Enterprise Digital Rights Management is the need for a local agent. With many of your external and temporarily collaborations such as contractors, vendors, auditors, lawyers, etc., installing an agent can be a hinderance to adoption. Let’s face it, collaboration whether internal or external puts a company’s sensitive information at risk. In 2016, analyst ESG (Enterprise Strategy Group) surveyed over 200 security professionals to understand their biggest data security concerns. With the research data, ESG identifies trends in the market and provides their recommendations for best practices when implementing data-centric security strategy. SAP contains highly confidential information and offers extensive risk controls, but once a report is downloaded this information can be shared internally and externally. Learn how Seclore is filling in the gap to ensure that access and usage controls are allowed only by the intended recipient. Aberdeen’s research confirms that the traditional tensions between enabling the business and managing risk and compliance are at play in what drives organizations to invest in protecting their sensitive data. Take a look at what has changed in the new generation of Enterprise Rights Management systems and the four key capabilities you should look for when selecting an EDRM system. CEO, Vishal Gupta introduces Seclore Rights Management and how the technology protects sensitive data that needs to be share externally. The ERM market comes of age. Traditionally ERM systems have been viewed as cumbersome rather than business-critical technology. This is now changing as agile, modern vendors are bringing feature-rich solutions with flexible interfaces and unobtrusive deployment models. Want to rapidly close the security gaps in your external collaboration? Don’t just rely on employees to manually secure files. Expand the security from your existing systems by automatically attaching security policies to a file once its downloaded, discovered and shared from a system. iSMG Banking Info interviews Seclore’s VP of Global Marketing, Lynne Courts on how Seclore rights management is solving the compliance regulation for information that is traveling beyond your corporate borders. This analyst report will assist in the selection of an optimal solution that will secure intellectual property and restricted information that is being shared between employees and business partners.